No pans were banged. No fireworks lit up the sky. There was no horn blowing or confetti. New Years on the farm came quietly. My parents always met up with the same group of friends for New Years. Good food and friendship saw the new year in. But most of the time, New Years came in quietly for the residents of Neff Road. The cows in the barn had no idea that a new year was taking place. Chickens slept and sheep pushed against one another in the barn making the floor look like a wooly rug. The dog was in the barn wondering why he couldn't sleep in the house. The cats were snuggled in the straw in the haymow. All was quiet on the farm as the new year came to be. My sisters and I have often talked of how we didn't celebrate birthdays or other big events. Oh, we had Christmas to celebrate, but most holidays consisted of church and family dinner. We seem to all remember having a big 10th birthday party and that was it for those yearly happenings. I'm not sure why it was that way. Mom and Dad never exchanged birthday presents and rarely Christmas gifts. Celebrations were not a part of our lives back that lane. I think perhaps this might be why we are so humbled when someone gives us gifts. We never learned how to receive. There will be no noise this New Year. I will probably see it arrive then make my way to bed. In the morning, the day will be no different than the day before even if it is in the year 2012. Quietly, I wish you a happy New Year, the same as if I were still living in the house on Neff Road. I wish you a new year of contentment and adventure, of receiving graciously the gifts that the new year will bestow upon you. Happy New Year, my friends. The snow fell in Ohio. My children and I had flown in on the red eye from Seattle the night before. Junior picked us up at the airport and drove us to the farm. We were exhausted. It was a long journey in more ways then one. My ex-husband and I had been separated yet living together. A marriage was falling apart, and I felt very alone in Oregon, my home of only a few months, trying to hold broken pieces together that would not heal. So I made the big decision. We went back to the nest to heal on the farm. Few people knew we were there. I didn't want to be pushed and pulled by opinion. My heart was broken and needed to be mended. My kids needed my parents' love. It was winter and the snow fell. There was a healing that took place back that lane. For the first time in my life, I handed my troubles over to my parents, so they could help me heal. For the first time, they didn't offer opinion, only love. I stayed in that nest for a month then made the decision to stay in Oregon and move forward. Was it the right decision? I don't know. Perhaps moving back would have been the best decision, but at the time, it was my only decision. Perhaps I write about Neff Road because it keeps me grounded in that love that thrived there so readily. I can always go back there in thought and words. The song that made my heart beat with nature at my back door still echoes despite the years. I am the better for having lived back that lane in a home that was loving and giving. Yes, I returned to Oregon and my life here with my children. Yet each day I can still reside in the big white house on Neff Road. Festival of lights. Tour of holiday homes. Downtown Christmas. Storybook land. Christmas Village. The list goes on and on. Events of light and sound held for holiday entertainment. I sat looking at the paper full of holiday 'walks' and wondered why Neff Road wasn't on the list. Sure it isn't a festival of lights or homes decorated by a professional designers. Yet, I think it might be a wonderful holiday event. Well, maybe not for everyone, but I'd go. I'd start with a caroling at Painter Creek Church, then I would make my way down the Hogpath past the recently demolished Franklin School where two generations of my family played in the halls. I would walk past Granddad Loxley's old octagonal barn, a beautiful sight in itself. Over the bridge I would go and walk down past Uncle Keith and Aunt Kate's old homestead. Maybe I could share a cup of hot chocolate with Janet and Don Rhoades. I would insist that my friend Brenda Sparks tag along with me. We would stop at her once home and remember other Christmases with the Stager family gathered around the tree. 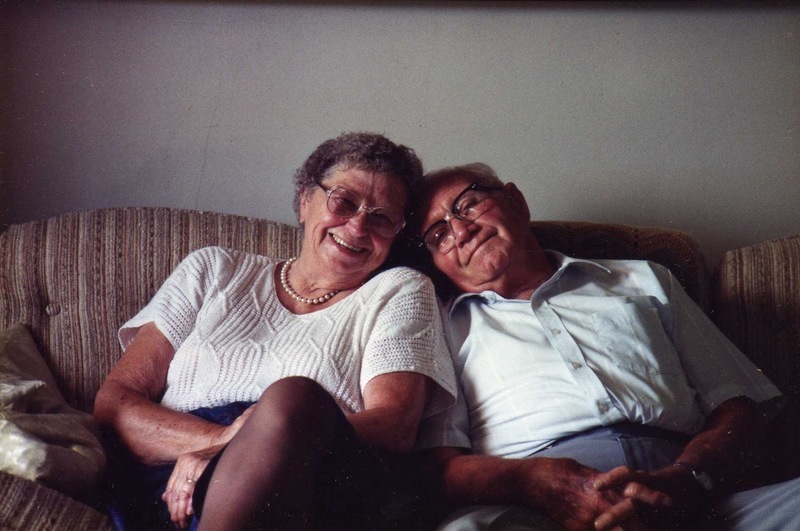 Doris and Victor Lavy wouldn't be home, but we would sit on the stoop and remember baseball games in the field. Next we would walk back the lane where many a Christmas tree stood. Santa knew this house well. He had a good chimney to go down and a little girl who awaited his surprises. Brenda and I would shed a few tears and a great deal of laughter. We might even go to the barn to swing once more. It would be the holiday walk down Neff Road. We all have a Neff Road, a place where our memories reside. Walls that knew Christmas when we were children. Walls that heard the laughter that I'm sure rings there still. Marshmallows over the fire in the fireplace. Loving arms wrapped around us. Friends and neighbors dropping in with Christmas wishes and sometimes cookies and candy. And, as we have our own visits down Christmas lane, so too do our families. Thank you for walking down Neff Road with me. We are all memories in the making. Memories saved for other generations. May your Christmas memories be many and the joy of each day be yours. Merry Christmas from the girl who lived back the lane on Neff Road. Each year I like to remember this piece I wrote about a time with my father walking through the barn. A memory of a sled. It hung in the milking parlor all covered with dust and cobwebs. Boards were broken, held together with wire. The rope tied to it was knotted by my father's hands. Dad and I walked through the barn remembering other days. He loved to share his stories. "That's my old sled," he said pointing to the greyed sled hanging in the corner. "I got it for Christmas when I was boy." He told me about the Loxley boys sledding on the snow, he on his new sled. 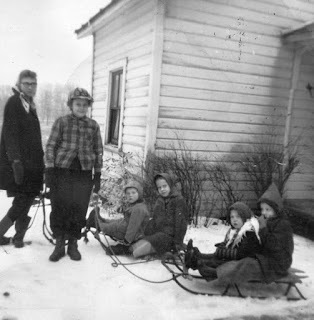 The same sled we sat upon, racing down the hill back the lane on Neff Road. The old sled now resides in the corner of my living room. A sled from Ohio to Oregon. From father to daughter. It was my father's sled. There. There in the corner. Ages old and weather worn, a remnant of the past, a remnant of my father. Too soon the earth captures her own, holding in her bosom the babe who played in her leaves, who fished in her ponds, who loved her earth, who fed and nourished the very soil of her cloak, who saw his own returned to her loving arms. Death, you are a blackness that comes quickly when least expected, silently hidden in the final assault. Your vengeance is cruel, your methods immoral. Yet you will not leave your throne until all have tasted your sword. Your shadow encompasses all who pass too closely. You, the victor over all who taste your wrath. But you cannot take away. You cannot erase the moments, the memories of the immortal soul. Listen. Hear the laughter of a small boy running to meet the first winter snow. Running to try his new sled on golden planks atop freshly waxed runners. His face is red, so bundled he can hardly run. Yet he laughs dashing to try his new Red Flyer. Listen. No darkness. Only memory. In the corner sits that once new toy. Now the runners are rusted, the lumber grey. Here and there broken pieces are held together with wire and dowel. Each scar a memory of a young boy's adventures. A fairly new rope knotted by old gnarled hands readied the craft for another pair of small hands. A small child eager to meet the first snow. It is a fine old sled that once, when new, held a fine young boy. We are all memories in the making. Memories saved for other generations. May your Christmas memories be many and the joys of each day be yours. Merry Christmas from the girl who lived back the lane on Neff Road. What is the worth of a history? Does it have a dollar worth? Is it worth a new best seller or a career in an already determined field? Is it worth anything to anyone else? Is it worth something to you? What indeed is the worth of your history? I'm learning what my history is worth. As I lived it and heard about that parts that I didn't live, I didn't understand the worth it held. Yet as I age, I know the richness that my life back that lane on Neff Road added to my life. I have discovered a new pride in the past that my family lived. I am richer in soul for the life of this country girl. 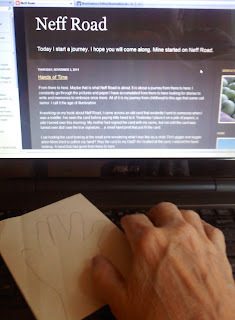 By writing this blog, I have discovered that my history is one that others are interested in for one reason or another. Perhaps the memories are shades of their histories as well. Maybe it is a glimpse into a certain era, a certain way of living. Or, maybe people are bored and decide to stop in for a visit. My history is rich because of my children. They will not have memories of my grandparents, my grandfather's farms. They will not know me and my sisters as children, young adults. My grandchildren will not know the life on a farm. They will not have the grandfather who takes them for a ride on a tractor or a walk in the woods. They will not walk out the door to see sheep, cows and chickens. Their history is rich. They should know it. My history is priceless. It is unique to me yet part of the whole, isn't it? All of our histories blend together to hopefully make a better future. Histories for our future generations. Some day someone will be much as I am today reflecting over their past. They might wonder what it is worth. 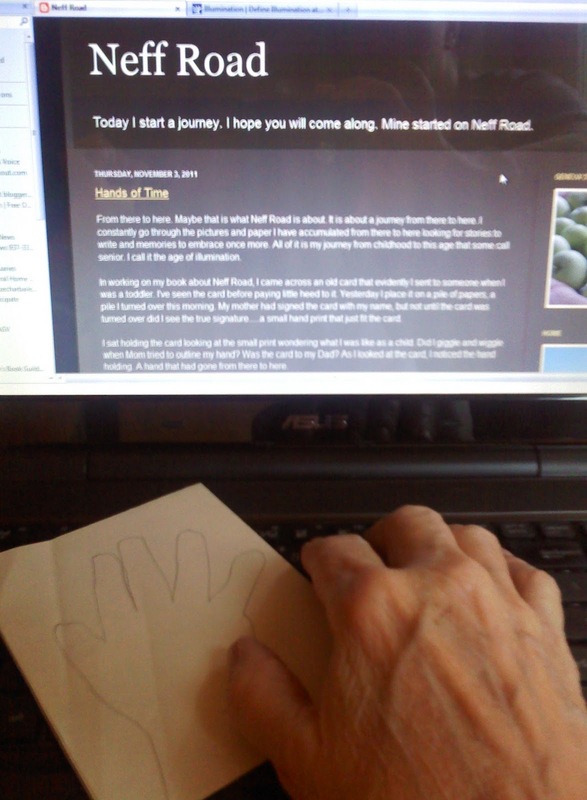 Maybe in looking a bit farther back, they will find a richness I have passed on, a look into a time that began my journey on Neff Road, my journey into their history. Good journeys, my friends. The worth of the history from there to here is priceless. This morning I woke to a chilly Oregon winter. No snow on the ground but a blanket of white frost tipped the trees. I'm living with my friends, Paulette and Mike. It is a new move for me and a good one. Paulette came back to Darke County with me in July and fell in love with my roots. Once in awhile deer wander into their yard. I'm always looking for them, and she is always hoping they will leave her plants alone. A couple of days ago I got a call from her. "They're in the backyard!" she exclaimed. "Three of them! I took a picture for you." Well, the picture is great, but I really would like to have seen the real thing. It got me to thinking of the little things we took for granted on the farm. After a night time snow, the activity of those sleepy hours was evident on the clean, unblemished surface. It wasn't unusual for Dad to pop his head into the kitchen door to announce that we'd had a nightly visitor. Maybe a fox. Maybe a raccoon. Always a possum. Dad knew where the sheep were headed and where the rabbits had been. My horse in her shaggy winter coat stood in the barnyard wondering what all the excitement was about. The dog came to the house to find a warm body. Chickens roosted a bit closer, and the horse trough would be frozen. Dad's boot prints would add to the others. 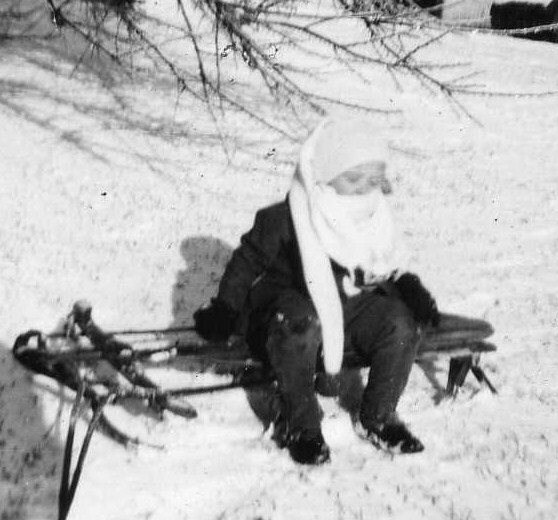 I was always fascinated looking out across the yard at the little grey indentations crossing the snow. They seemed sometimes to wander and circle as if looking for something. Other times they were in a straight path to a destination. Many lead to the barn where the critter could find warmth. The night time visitors to the farm left their signs. I wonder if as a child I looked for reindeer hoof prints. I'm sure they would have been evident. Of course, Dad wasn't about to climb up a ladder to check out the roof of the house. Well, anyway, we had plenty of prancing and pawing in the barnyard. The prancing of pawing of each little foot...er, hoof. She stood in the snow with her fur trimmed winter coat and heavy stockings. A 1930's hat on her head, she looked a bit like someone from the flapper era. Young Mom and her banjo.....with hair longer than I ever saw on her. 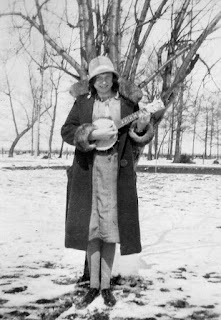 I never saw my mom play the banjo even though one sat in the upstairs closet all of my life. I don't know why it never crossed my mind to ask if she would teach me to play. I look at the picture and wish I'd known Mom had this photo album, this album we found when we cleared the house. So many questions and she isn't here to answer them. Why didn't she pick the banjo up again? Once in awhile she would do the Charleston for us. She always played the piano. I feel short-changed. I think perhaps I would have enjoyed playing a stringed instrument, the cello, guitar, BANJO! My hands won't allow it any more...or any less. 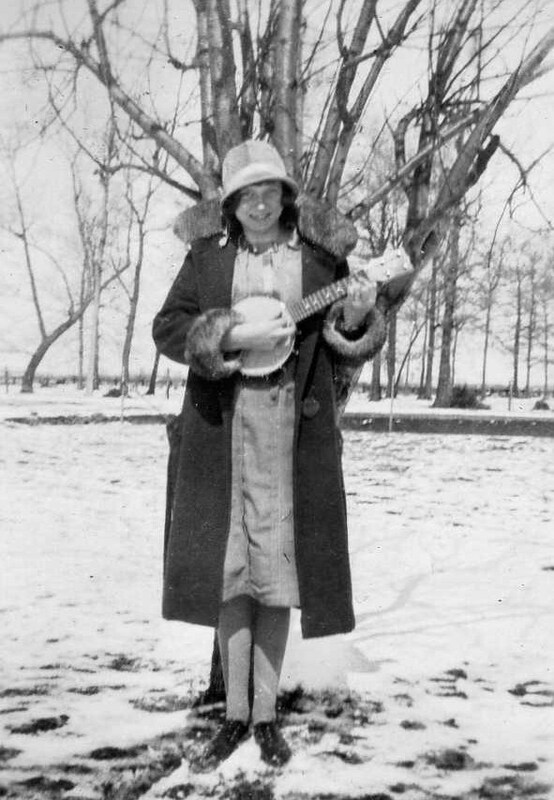 A woman standing in the snow, banjo in hand. A woman of laughter and fun. A woman, my mother. It was a day event. 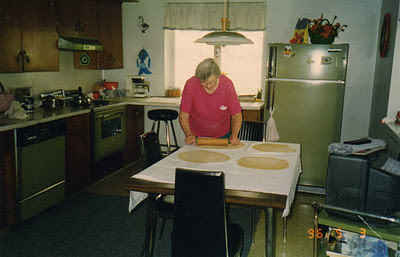 The dough was made then put aside to set for a couple of hours before Mom rolled it out into thin sheets. Mom was making noodles. I'm pretty sure that if one were to ask any family member who remembers our days on the farm what was the favorite food, Mom's noodles would be the number one pick. Fresh eggs from the hen house and Mom's magic hands made memories. I can't think of the holidays without thinking of Mom's labors of love in the kitchen. She was a born cook. We sat at the table talking with neighbors, friends and family while Mom cooked. We all knew to stay out of her way. Maybe we migrated to the table drawn there by the aromas and laughter that drew us there. In later years when I had moved away, Mom would send as part of our Christmas a bag of homemade noodles. The kids would squeal with delight. The perfect gift. None of us can quite capture the method or the taste involved with Mom's noodles. I no longer get a bag of her noodles in the mail. But as I write this, I find myself smiling at the delight over the years that came when Mom made her noodles. Hm. Maybe I'm hungry. I think I'll go eat leftovers. We sat around the table. One of the few times our family would all be together for a holiday. I was expecting my first child. The year was 1971. In the blink of an eye, time passes. The children once wiggling in their seats waiting for Grandma's good cooking are settled into their own homes and lives. The gatherings no longer happen where once the relatives abounded. 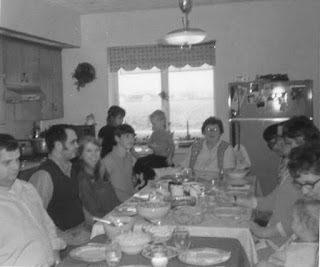 Each year I recite the same litany of the Thanksgivings when the Johnson's came to dine with us on Neff Road. Mom and Dad always hosted the event. 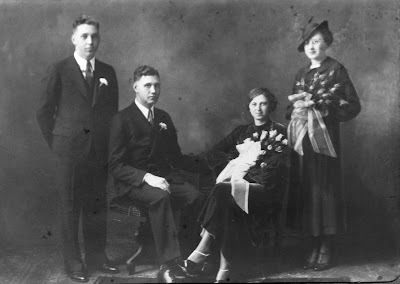 The tradition went on for as long as Aunt Welma and Uncle Bob were around. I know that Mom and Dad must have felt the changes, the losses. Still those of us who sat around that table knew of Aunt Welma's butterscotch pudding and Betty's beans. Mom's pumpkin pies. Then men watching football, and the card table brought out for the yearly puzzling. We started with lunch and ended with dinner. Or, as they say in Ohio: We started with dinner and ended with supper. No matter how much I want that same feel of Thanksgiving, I know will not happen. My children have their own lives, and there is no extended family here. Priceless are the memories of those Thanksgivings back the lane on Neff Road. Priceless were and are the people. To you, my readers, happy Thanksgiving. Enjoy those around you. Make memories for a lifetime. Savor the tastes, the sounds. Most of all, embrace one another in love. From Neff Road to you, God's blessing this Thanksgiving Day. This is a story I share from our history as told to me by my Uncle Bob Johnson. I came across it when putting together my book Neff Road and wanted to share it. This story was told to my uncle when he was a child by my great grandmother, Parolee Johnson. I relate it in my uncle's words. Grandmother "Pal" was all a grandmother could be. Always happy and telling me things I liked to hear along with a piece of butter bread or a cookie. One of her stories I remember well. She and her husband Jim moved into a little two room log cabin, a kitchen and bedroom, about 200 feet north of Painter Creek. She had finished her morning work and heard horses outside. She looked out the door and there were two grown men, tying their horses to the hitching rack. They walked up and knocked on the door. She answered and was told that they had been riding all night and could she give them a bite to eat. She fixed breakfast for them and invited them in. They ate very hearty and when finished expressed their thanks for the good food. On their way out, she asked them where they were going and the one said that they had been to Kentucky to see relatives and was on their way back to Missouri. As a last word, one turned back and said," I am Jesse James and this is my brother Frank." Rich is the history of Neff Road. A place that began with dirt roads and paths and men on horses. When the new kitchen came along, Mom and Dad got rid of the old dining set. The heavy furniture that had accompanied us our entire lives was gone. We sat at the table. Mom and Dad at the ends of the table. I am sitting next to Pop Johnson. Cousin Camille sits next to him. My sister, Peggy is next to Mom along with my brother-in-laws, Paul and Bob. The old grandfather clock stood in the corner. A clock that once chimed 84 times when I came home from a date late one night. I know because Dad counted each chime. The heavy dining room suit would find its way to a friend's house. The table I played beneath for hours would live somewhere else. 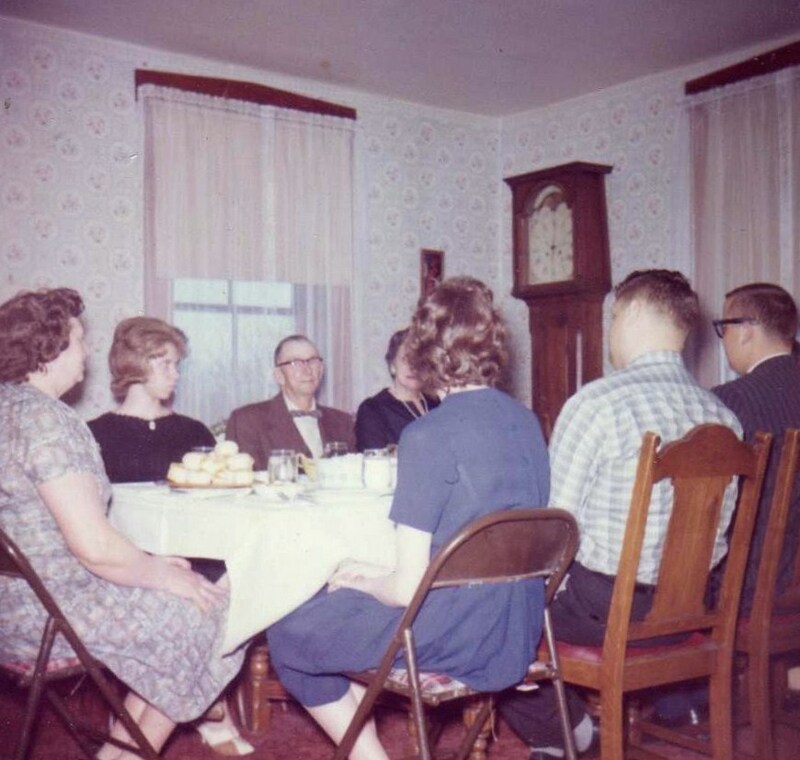 The china cabinet that held Mother's favorite dishes would disappear. The room that had seen dinners with relatives and friends would turn into the master bedroom. All that was of our meals there would be gone. Well, not really. I'm not sure if there was another table in the kitchen full of other family members. Camille's husband, Leonard is not evident, and I believe he was still living at that time. My sister, June, seems to be missing as well. I'm thinking there might have been some other Johnson's at the kitchen table. It seems like yesterday that this picture was taken. When we sold the farm, I found the pair of shoes that I'm wearing in this picture in the old closet. They were a bit tattered suggesting that maybe some children had been playing dress up. They had been my favorite shoes with pointed toes and a wine glass heel. Of course, they had been new thirty-eight years before. The china now resides with my sister in Indiana, the clock is living with my niece. For me? I have the best part of all.....I have the memories. They sat beneath the grape arbor. A grandmother. A great grandmother. They sat with two granddaughters who would always remember them. On a sunny day, they made a memory. My sisters have memories that I, born years after them, do not share. I'm jealous. I want those memories, too. Sometimes I look at these faces trying to absorb what I can of the women who touched the lives of so many. Still all I have are pictures....pieces of a time I did not know. Maybe that is why Neff Road is so important to me. I want other generations to know more about their roots. Not just a family tree but a story of the past and profiles of the people who share their genes. Perhaps I want to have a conversation with those future generations telling them that there were wonderful people who came before who loved, who struggled, who were full of laughter and talent. Now I must try to find glimpses of those I never knew. Their lives are the roots of who I am. Perhaps through the window of my writing those to come will discover more pieces of themselves. Most of my life I was asked if I was Ethel Loxley's granddaughter. She touched lives. She had a sense of humor and a loving heart. She was intelligent and bore much during her years. I know my great grandmother by the words of my cousin, Alma Lea. I can see in the pictures the love she gave to the children she held. I have only glimpses, but those who remember give to me the women in the pictures. I think we make a mistake by just drawing lines from name to name showing our roots. My sister has included in her family history profiles and pictures of each person. She writes history in each entry. She passes on a gift to future generations. They sit beneath the arbor. A moment captured. A moment that today includes me. So whatever is going around has taken me in and begs to remain. How I wish I was back on the farm with Mom to look after me. We seemed to be ill a lot on the farm. I attribute it to a drafty house and sometimes not the most sanitary of conditions. It wasn't unusual to play in the barn then come into the house to grab something to eat....bypassing the hand washing. Mom was great at providing an atmosphere of care. When I was sick with German measles or a miserable with chicken pox, Mom made soup and saw to my every need. She held our heads when we were feverish wiping our faces with a damp cloth. She held us when we were in misery and sat with us when she could. After we got the TV, Mom made a bed on the sofa for her ailing child. We always knew that Mom would take good care of her ill children nursing them back to health. When a Loxley girl was ill, neighbors and relatives stopped by to see how the ailing child was doing. Sometimes they brought something for us to eat knowing that Mom had her hands full. Sometimes they came and sat with the child. Our medical staff was the people who were part of our lives. Dad always stopped in during his busy day to bring some sunshine to the sick child. Sometimes he even brought in a winter breeze. Even though I'm sixty-four, I still want the loving hand of my mother on my brow. 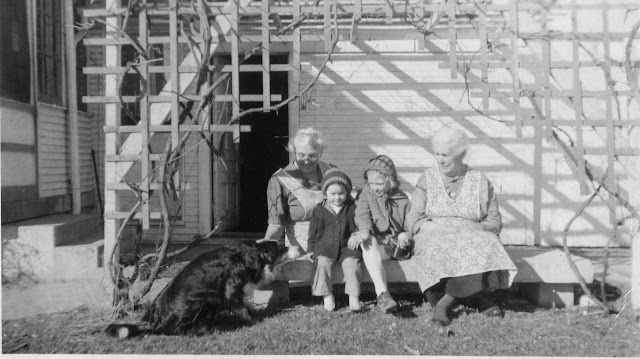 I want to crawl back into the warm memory of the past and be visited by Doris, Margaret, Betty and even the men of Neff Road who cared about the Loxley girls. Today I think I might live. It's a struggle, but I'm working at it. I still hear my mom asking, "Can I get you anything?" Oh, yes, Mom. Oh, yes. The wheels that got us from there to here. From the Johnson's to the Loxley's. From the farm to Greenville. From Ohio to Michigan. The wheels that carried generations of my family. The romantic side of me would love to have lived in a time when horses were the mode of transportation. A sweet carriage ride with a young man. The smell of the horse, the wind in my hair, the creaking of the saddle. I was a little over one generation away from those day. My mother was on the edge of that day and age that was leaving Neff Road. I love this picture of my great grandparents, Sarah and David Ernest, riding in the buggy behind this enormous, sway-back. I want to know more about the horse. 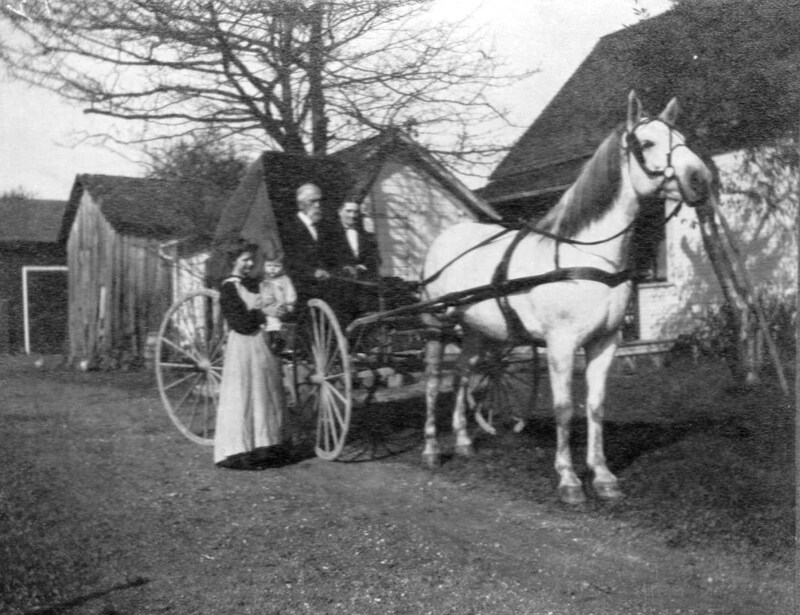 Who is the young woman who stands next to the buggy. I want answers! I want to ride in that buggy behind that huge horse that only a little girl from Neff Road could see as a beauty. Granddad Loxley loved cars. I remember washing his Edsel when I was a kid. 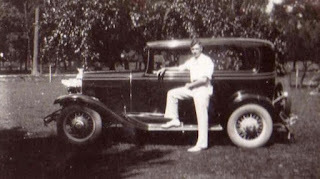 He had one of the first and few of these cars that showed up in Darke County. My Dad stands next to a car that took the family on a trip west. A handsome picture. 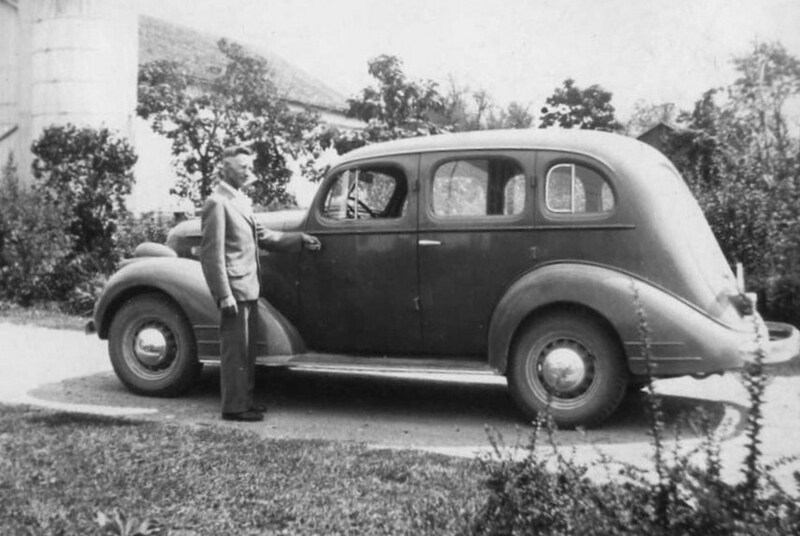 With affection, I remember our old, black Packard. I was recently explaining to my granddaughter about riding in a car with the front seat a bench like that in the back. "Three people could sit in the front?!" My how time flies. 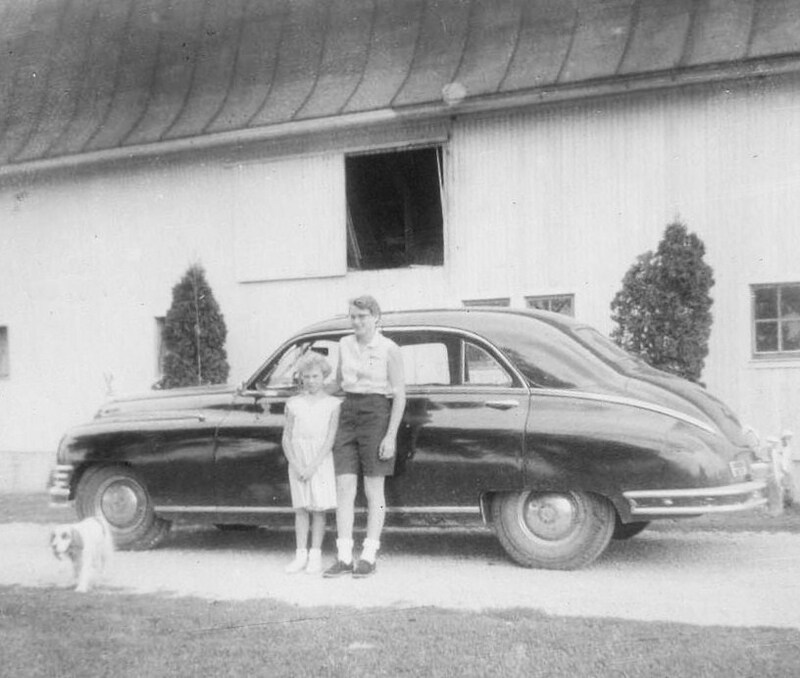 The family wheels have a history. Again, it is the small things in pictures that we fail to notice. The history that sits in plain sight. From the wagon wheel to the Honda that sits in my driveway, the generations in my life saw them all. He ran to the trees where the tiger lilies bloomed. "Mom, it's here!" I never knew my great grandfather Ben Loxley. From all of the stories I've heard of him, I'm not sorry that I didn't meet the man. However, I am always wanting to know more about my family (you probably already knew that). I've written about this before, but I though a 'before and after' might be fun. 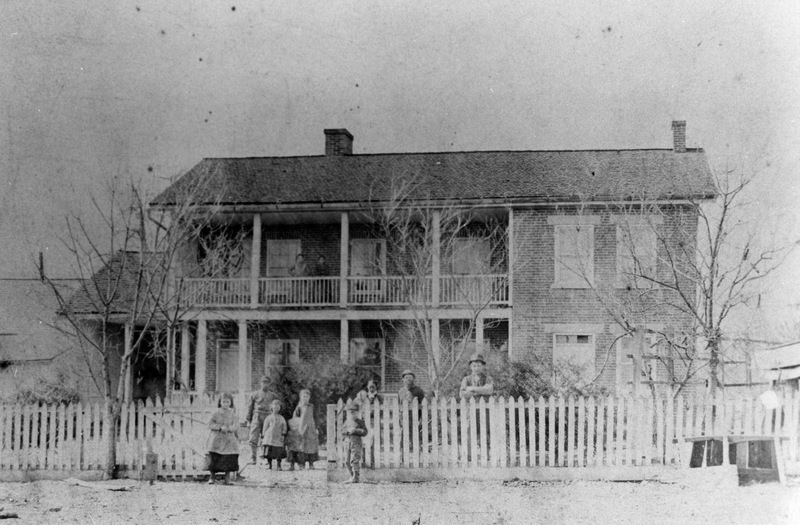 The old Loxley homestead is located outside of Bradford, Ohio. At that time, Grandpa Loxley was a prosperous farmer. I think he had as many acres as he had children. That's another story. At one time a lovely house sat back a lane in the middle of the acreage. The house that we found had been burned down for the most part. Some of the brick walls were still standing. James and I walked through the house. This house that had seen the death of a woman and the birth of many babies. A house full of history. Some we would never know. I touched the bricks and thought, "This is a place of my beginnings, the place where my grandfather was a child." James was checking out every inch of the house. The gaping hole of the old cistern sat in the corner of one room waiting to swallow whoever wandered blindly into the hole. 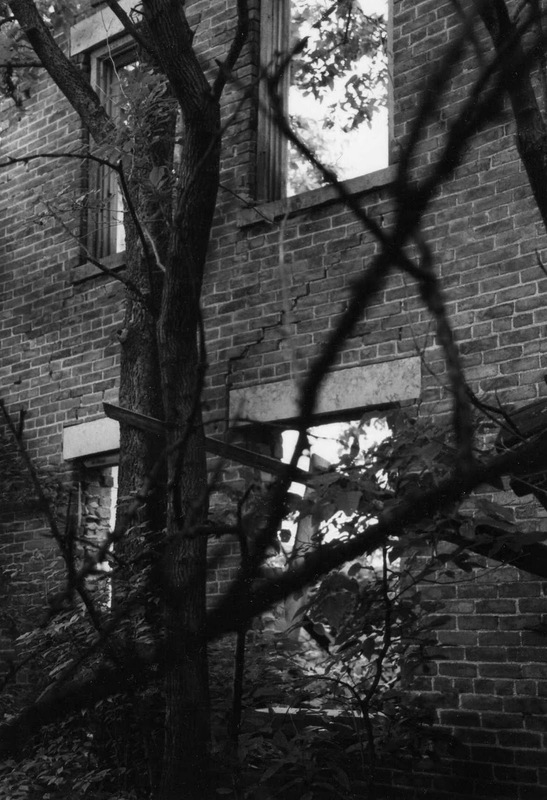 Even though vines and plants had overtaken the house and trees pressed against its sides, the new growth could not erase the eeriness of this place. A place of unsmiling children. With my hands hidden beneath the blanket, I held my baby daughter so she wouldn't fall over during the photo session. I did the same for my son. Mom under the baby blanket holding up the wobbly baby. I came across this picture recently. It is an old tintype. It is out of an album that was given to me....not family. However, the history of the 'early method' of holding a child for a picture is quite evident. This picture has given me a quite a few giggles. I feel lucky that I didn't need to cover myself with a blanket waiting for the photographer to take the shot. 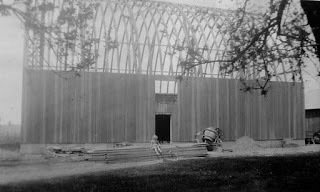 I did a little research on tintypes finding that there is actually no tin in the aforementioned. 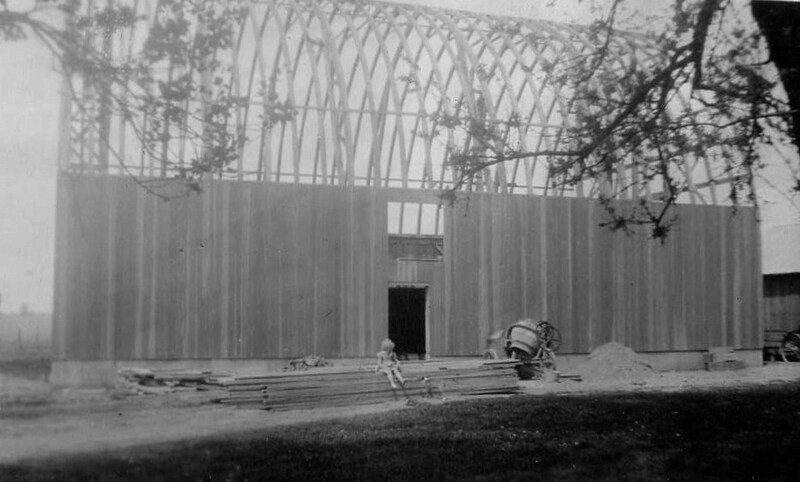 The pictures were taken with a twelve lens camera and produced on metal, but the metal was not tin. And the negative type pictures are priceless. I am thankful to have the tintypes recalling another day and age. 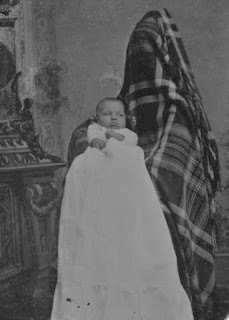 Most of all, I love having this one of 'mother' and child.